This toy is a great combination of simplicity and elegant design. Ramp walkers are nothing new but this model is great. 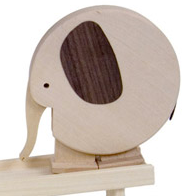 The Automata Blog: Charming little rotund wooden elephant ramp walker toy.